How many times have you stood in line at the airport watching others breeze through security with no hassle? By enrolling in TSA Pre✓® , you too can breeze through security. Keep your shoes, jacket and belt on; your laptop in its case; 3-1-1 compliant liquids in your bag; and enjoy a better overall airport security travel experience. 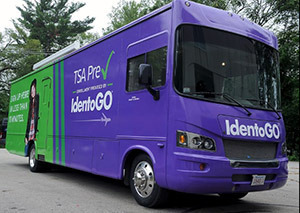 TSA Pre✓® allows low-risk travelers to experience faster, more efficient screening at participating U.S. airport checkpoints for domestic and departing the U.S. for international travel. The Mobile RV is equipped with steps and is not wheelchair accessible. If needed, please use the "Find an IdentoGO Center" feature on our website to determine the nearest permanent location that is ADA compliant. Monday, March 25th - Thursday, April 4th, 9:00 AM - 12:00 PM & 1:00 PM - 5:00 PM, Friday, April 5th, 9:00 AM - 12:00 PM. Closed Saturday and Sunday. Tuesday, April 16th-Thursday, April 18th 9:00 AM - 12:00 PM & 1:00 PM - 5:00 PM and Friday, April 19th, 9:00 AM-12:00 PM. Monday, April 29th-Thursday, May 2nd, 9:00 AM - 12:00 PM & 1:00 PM - 5:00 PM, Friday, May 3rd, 9:00 AM-12:00 PM. Monday, May 6th - Thursday, May 9th, 9:00 AM - 12:00 PM & 1:00 PM - 5:00 PM and Friday, May 10th, 9:00 AM - 12:00 PM. Lubbock, TX | Lubbock- Silent Wings Museum, 6202 N Interstate 27, Lubbock, TX 79403. Monday, April 1st - Thursday, April 4th, 9:00 AM - 12:00 PM & 1:00 PM - 5:00 PM, and Friday, April 5th 9:00 AM - 12:00 PM. Monday, April 8th-Thursday, April 11th 9:00 AM - 12:00 PM & 1:00 PM - 5:00 PM and Friday, April 12th, 9:00 AM-12:00 PM. Monday, April 8th - Thursday, April 18th, 9:00 AM - 12:00 PM & 1:00 PM - 5:00 PM, and Friday, April 19th, 9:00 AM-12:00 PM. Closed Saturday and Sunday. Monday, April 29th-Thursday, May 2nd, 9:00 AM - 12:00 PM & 1:00 PM - 5:00 PM. Monday, May 6th-Thursday May 9th, 9:00 AM - 12:00 PM & 1:00 PM - 5:00 PM, and Friday, May 10th, 9:00 AM - 12:00 PM. Inside Turtle Transit’s warehouse on Fox Road, workers put the finishing touches on a 38-foot Georgetown recreational vehicle decked out with advertising for the Transportation Security Administration’s PreCheck service. The RV will be a select Boston Red Sox home games throughout the year. Appointments can be booked 45 days prior to the game.